So, I was lazy and set the pizza box on the deck table with a couple pieces of crust left over. A few hours later we heard rustling on the deck. The dogs and I were confused, so we went to check it out. 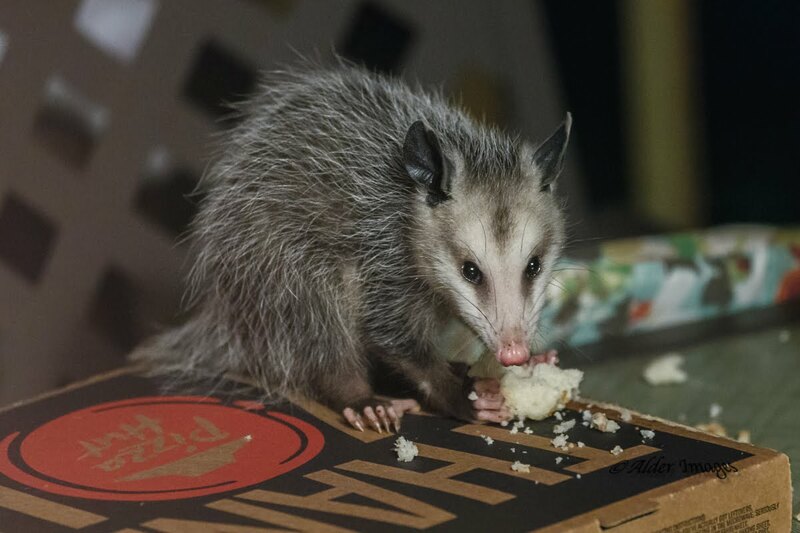 Much to our surprise was a visitor finishing off the leftovers. You wouldn't believe how we were no more than 7 or 8 feet from each other, me and the drooling canines behind the patio door and him just hanging out on the table. This baby opossum continued his meal watching our every move as I snapped away. Once he finished up, he climbed off the table, left the deck and over the fence.